Forthcoming, Vol. 34: Class History and Class Practices in the Periphery of Capitalism, P. Zarembka, ed. Thomas Ferguson, University of Massachusetts at Boston, U.S.A.
Jan Toporowski, SOAS, University of London, U.K. 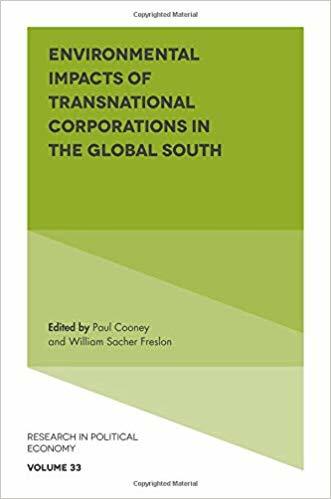 This volume explores the impact of Transnational Corporations (TNCs) on the environment of the Global South during this period of neoliberal globalization. Since the end of the 1970s, the role of TNCs in the global economy has developed significantly, and the subsequent changes to international institutions and the establishment of free trade zones have limited the effectiveness of environmental protections. Drawing together contributions from several continents, this important book examines the environmental consequences and crises resulting from these changes. It highlights the negative impact on the environment, ecosystems and ways of living for many people across the globe and shows how this is reflected in the struggle between corporate interests, social movements and human rights. Developing key themes around transnational extractive activity, especially mining and oil corporations; the impact of transnational capital on indigenous or traditional populations, and the role played by international institutions, Environmental Impacts of Transnational Corporations in the Global South is essential reading for researchers and practitioners within the field. Statement of Purpose: This RESEARCH annual is founded on analyzing society in a manner consistent with the importance of the role of class. International in scope, the annual volumes deal primarily with economic and political issues and the unity between them. Both theoretical and empirical works are included. While published papers must be appropriate for developing class analysis of society, they need not be explicitly marxist. The RESEARCH can accept papers up to 20,000 and thus, in addition to usual journal length papers, is appropriate for work which is not book length, yet is substantial. For submissions, please send your paper, double-spaced type with noting as endnotes followed by a reference list, to the editor either electronically or three copies to the postal address above. Usual practice is review by two competent persons, on a double-blind basis, within a relatively short period of time. "... has played a very positive role in developing the scientific Marxist agenda"
Click on "Links" to return to the top. Marx's Value, Price, and Profit (Abridged): An Introduction to the Theory of Capitalism provides an introduction to substance of his argument. The Marx-Engels Library has provided the very useful service of on-line text of much of Marx's writings (including Capital, Volume 1) and including searching of its entire on-line library, and also including other Marxist writers. Biographies and texts of writings of some 100 major figures in the history of economic/social thought, including Marx, Engels, Lenin, Luxemburg and many writers who were the focus of Marx's attention, are provided on the Akamac Web Site. An extensive Lenin on-line library is available at the V.I. Lenin Library. A modern, popular presentation of issues surrounding Marx for the 21st century is available in the near hundred-page Special Issue "La pensée de Marx", Le Nouvel Observateur, October/November 2003. Links closely related to the R.P.E. include the Monthly Review, founded in 1948 as an independent socialist magazine (with a lead article by Albert Einstein) and including a book press, and Union for Radical Political Economics, founded in 1968 to support interest in radical analysis of political and economic topics and publishing the Review of Radical Political Economy. In the U.K., we point to the Conference of Socialist Economists, a membership organisation founded in 1970, and its journal Capital & Class, published three times a year since 1977, in France to Actuel Marx, and in Chile to Izquierdas, including links, some of which are in English. LaborNet, mainly U.S. focused, supports the "guarantees of human rights and economic justice for workers". An internationally-oriented site is LabourStart. "An Introduction to September 11"
"Evidence of Insider Trading before September 11th Re-examined"
"Critique of David Ray Griffin regarding Calls from 9-11 Planes"
"A Challenge to Geopolitical Economy: September 11th and Conspiracy Theory"
at Truth and Shadows: "A Novel Idea: Rebekah Roth's Methodical Illusion and What Happened to the Planes on 9-11"